“Renting in New York City is like no other experience,” Udi Eliasi, a broker from real estate firm Compass, tells Thrillist. The rental process here is an incredibly confusing one, and it’s normal for first-timers to get overwhelmed. You could spend hours scanning apartment listings online (on any given day, CityRealty.com may have between 20,000 and 50,000 active listings) only to find you’re not even eligible for the apartment you want. Many novice renters will also choose not to work with a broker to avoid paying a fee, but then quickly realize what an exhausting process it is to negotiate directly with landlords and property managers to see units. And that’s to say nothing of the paperwork necessary to actually secure your first New York apartment. Even longtime New Yorkers -- seasoned tenants who have lived in multiple boroughs and have dealt with dozens of landlords and brokers -- can improve upon the experience of renting an apartment. So what is a requirement? We spoke to a number of New York City real estate pros -- licensed agents and other authorities on the city’s rental market -- to figure out the biggest mistakes New Yorkers make when apartment hunting. And, most importantly, how you can avoid these all-too-common traps. Everyone we spoke with said the easiest way to avoid making a mistake while searching for an apartment is to be ready to submit an application the moment you find a place you love. “Have your supporting documents easily printable and at the ready,” says Jason Hernandez, an agent with Douglas Elliman. According to Hal Gavzie, head of rentals at Douglas Elliman, that means having a letter of employment, last two pay stubs, last two bank statements, tax return, and photo ID on-hand, whether you’re applying for a rental, co-op, or condominium. All documents should be less than 30 days old. There are other things to keep in mind, too, like the standard New York rule that renters should make at least 40 times the monthly rent. And renters will likely need to put down the first and last month’s rent, and a security deposit equal to at least one month’s rent. There will also be a broker fee (at least one month’s rent) and miscellaneous application processing fees, key fees, and more. Essentially, you need to have a lot of money available up front. And if you don’t have the assets or the necessary income, “have other incentives ready,” says Compass agent Grant Braswell. Get a guarantor who makes at least 40 times the monthly rent, or enough cash to pay an extra month’s security deposit. Christine Mariani, an agent with Compass, says to be sure all those funds are available in a US bank account, because you’ll need to cut a check very quickly. There’s really nothing worse than finding out the apartment you loved most has already been rented out. “You need to be prepared to pounce on a good apartment when it comes your way,” says CityRealty.com’s Gabby Warshawer. “I’ve seen too many people lose apartments because they were dragging their feet,” Eliasi adds. Before you begin your apartment search, be sure to run your own credit report. You can most likely do this for free through your credit card, though according to the Federal Trade Commission, everyone is entitled to one free credit report every 12 months. It can be ordered online at AnnualCreditReport.com. As Eliasi notes, “you may lose an apartment” over something as small and correctable as a $50 medical bill or parking ticket. Burke isn’t the only agent to stress the importance of having specific requirements in mind before you begin looking at listings or working with an agent. “Do not view anything that is above your budget,” says Hernandez. In fact, he recommends giving your broker a price range that is below your budget “to gain perspective.” As he points out, “your $3,000 budget looks great when you know what $2,500 gets you,” but if you look at units above your price range, you won’t be thrilled with what you can actually afford. One of the key factors in having a successful -- and not horrific -- apartment search is maintaining realistic expectations. “Be educated about how far your money can go in the neighborhood you want to live in,” reminds Warshawer. It’s also a lot of extraneous effort for the renters. Burke suggests calling a few agents, discussing your criteria, and working with the agent that “best understands your needs and has the best knowledge” of apartments in your desired neighborhood. “Otherwise you run the very likely risk of wasting time, energy, and seeing the same apartments multiple times,” Burke adds. So you managed to avoid the pitfalls and find an apartment you love. Congrats! Still, it’s not over yet. 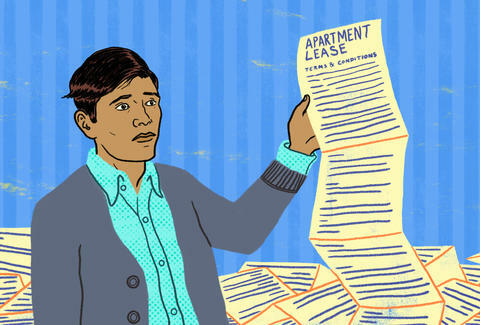 Reviewing your lease (yes, even that very fine legal jargon) is as crucial as inspecting your apartment before you sign anything. “If the landlord verbally promised to repair or replace something in the apartment but the lease says ‘as is,’ you have no ground to stand on,” says Burke. New appliances, for example, should be installed before you move in a single piece of furniture. And if your landlord promised to have the apartment professionally cleaned, that too should be noted in writing and completed before you arrive. A lease could also contain deal-breaking conditions (maybe it’s a two-year lease instead of one, or heat and hot water isn’t included) and crucial information about past bed bug infestations. Don’t be afraid to ask your broker to examine the lease and note anything unusual or concerning. “Landlords in New York City are much more shielded than other places,” notes Eliasi. For that reason, real estate agents play a larger role negotiating, advising, and guiding potential renters through the murky, completely mad process of renting an apartment in New York City. Melanie Taryn Lieberman has made almost all of these mistakes, and -- out of the goodness of her heart -- wants you to have a less nightmarish time renting an apartment.